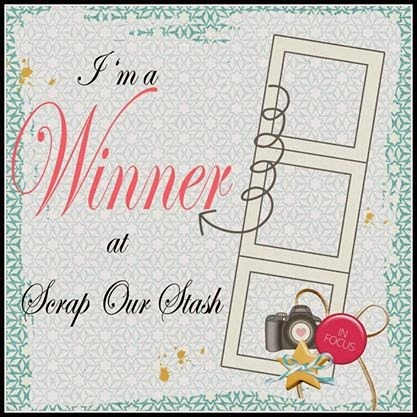 Sorry we are a little late in announcing the April winners! 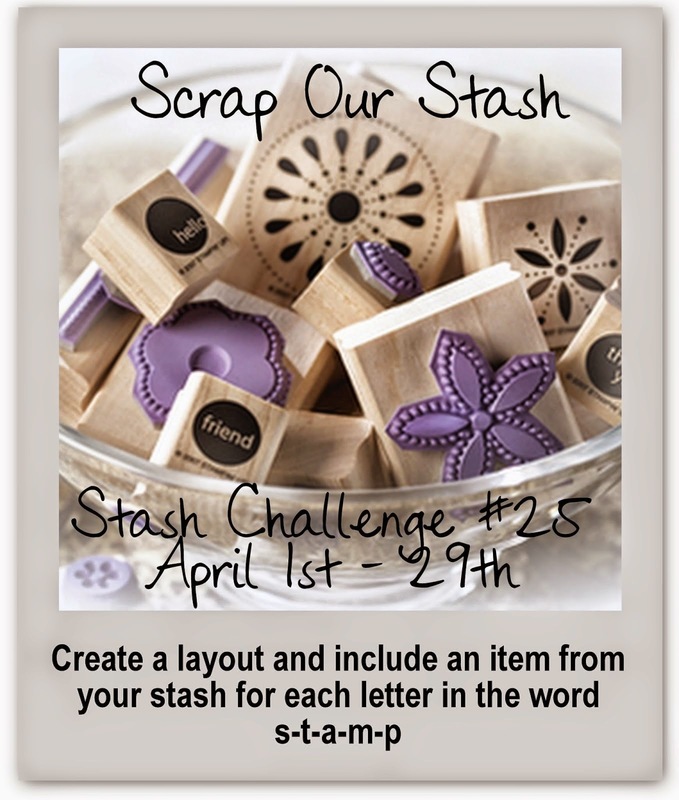 Make sure you stop by tomorrow for our May Stash Challenge!!! You can use the colors, shapes, phrases, etc. 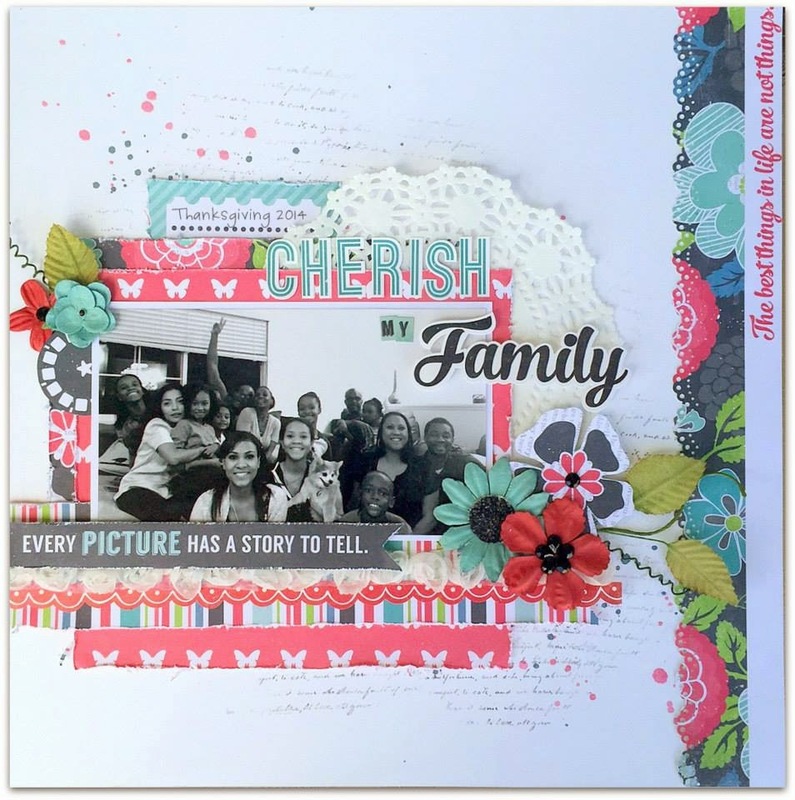 just let us know in your write up what element of the photo you used as inspiration to complete your layout. For each challenge you complete you will receive an entry into our monthly prize drawing! So complete both challenges and that gives you two chances to win! You will earn in entry into the April prize drawing for each challenge you complete! Click HERE for both challenges and details! "The first thing that inspired me most about the inspirational photo was the color palette. 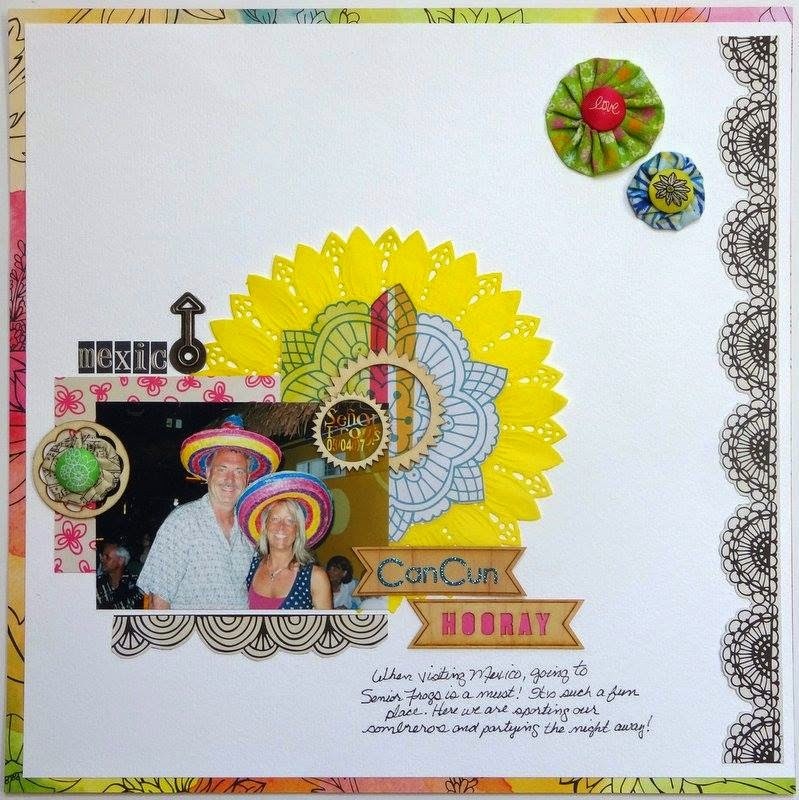 I just love happy, bright colors! And I instantly knew which photo I was going to scrap too! I dug into my older paper collections and Sketchbook by Amy Tangerine was the perfect choice. I gathered up some bits and pieces of the papers and did some fussy cutting as well. I also included a bright yellow flower doilie that was perfect for the colors too, along with some homemade yoyo flowers that I've had stored in a jar for years. 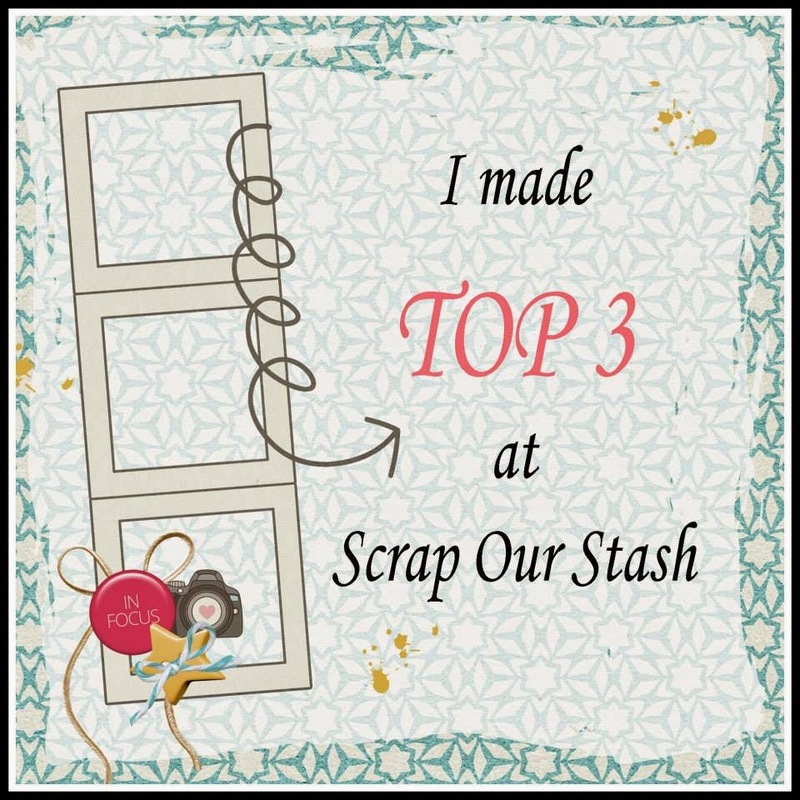 I'm really enjoying myself being on the SOS DT because it's giving me the incentive to actually dig through my older, stashed product and use it up!" For complete challenge details and rules, click HERE! April sketch and photo inspiration! Enjoy the rest of your day and stop by tomorrow for more design team inspiration! "First 5K in 2014 and it was so much fun! Color Run at the National Harbor and the temps were perfect, Had a foot injury so I walked it and it was still lots of fun with the bff and my daughter! Great sketch and I had fun pulling out all my Bella Blvd stash! 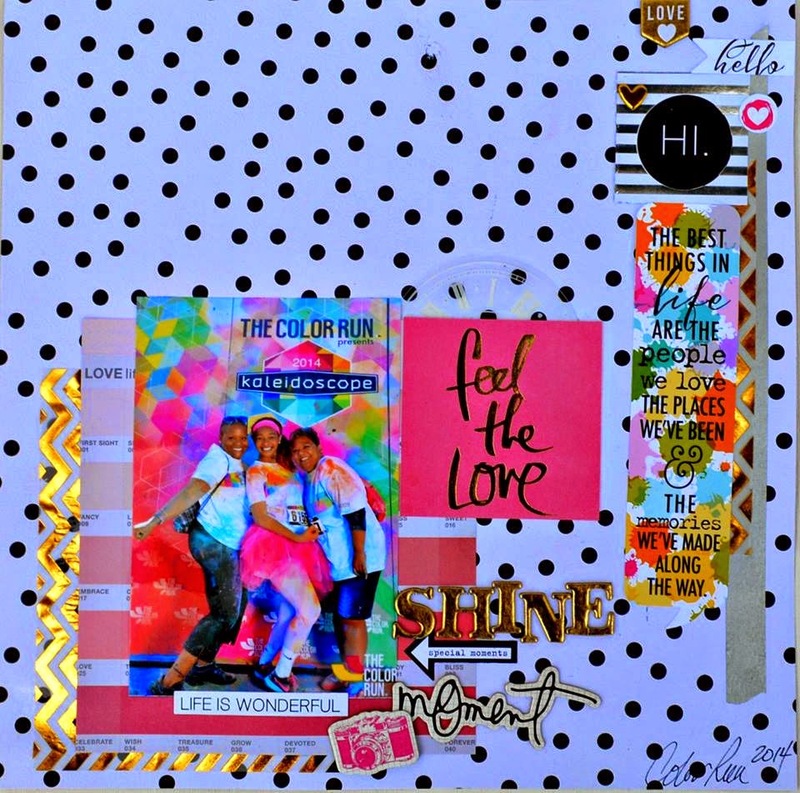 I was inspired by the mood board in so many ways: First, it had my love of GOLD, then I was inspired by the polka dots, the rainbow colors with lots of focus on fuchsia and the feeling that the layout should be about something that made me very, very happy!" As always we appreciate you stopping by our blog as well as your comments. Hello and welcome to another day of our daily Design Team inspiration! "I love sketch challenges and usually stick to them pretty closely. This one is no exception and the mood board additional direciton. 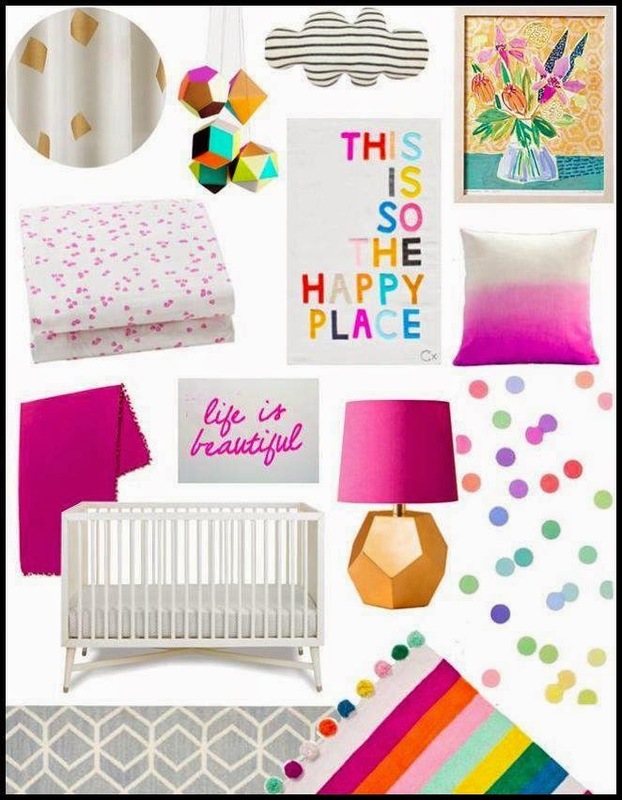 From the mood board, I was inspired by the geometric shapes, the word "happy", the colors (especially pink, gold, and teal), and the cloud." Thank you for visiting us today and I hope you get a chance to stop back by tomorrow for our daily Design Team inspiration! "I was inspired by the colors and the painting of the flowers in vase. I had leftover exclusive printables from a class I took, Color Theory with Wilna, and the minute I saw the inspiration, I knew I had to use them. I basically colored in the printables using acrylic paints -keeping the color scheme in mind. 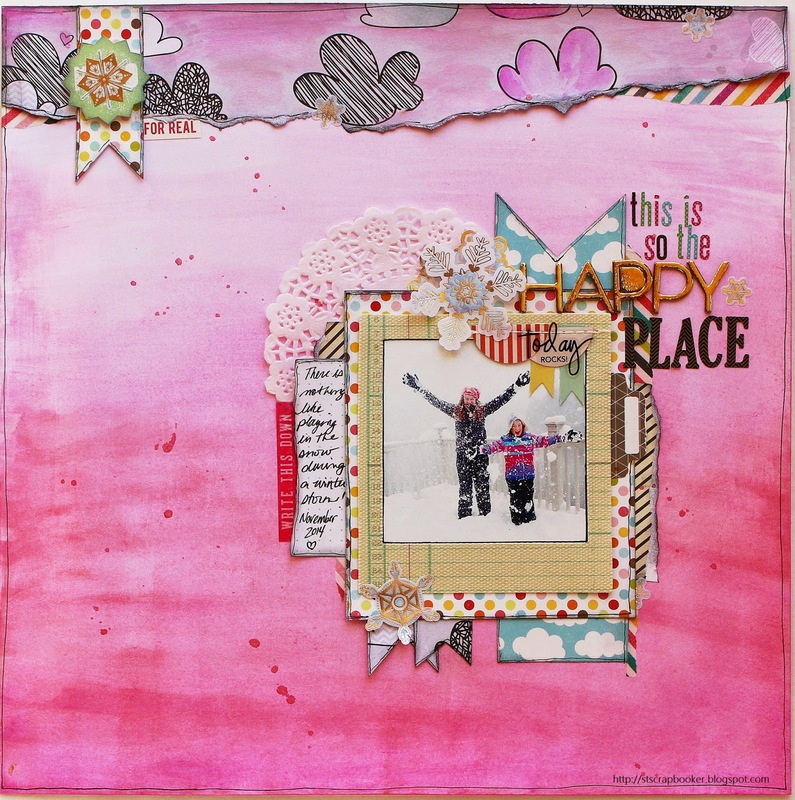 I completed the layout using Pink Paislee Bella Rouge and following the sketch pretty closely. Why I titled the layout "Be Persistence" when that is not grammatically correct? It is a reminder that I need to embody persistence not just be persistent to succeed. I decided the theme of my wedding album is about the philosophy of life lessons, ones I have learned and want to pass on. On this day, it took us all day and 3 different locations to get a couple of "good" photos of us -that is persistence." As always, we appreciate you visiting our blog and would love for you to return tomorrow for more Design Team April Sketch inspiration! "Fun sketch! 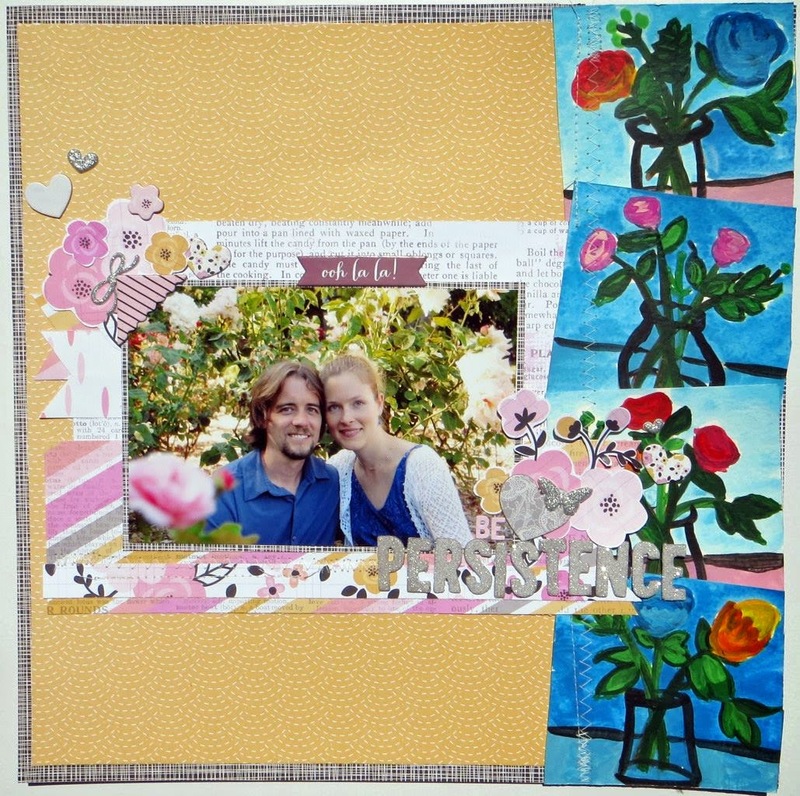 I used some new summer-colored papers and some very, very old ribbon on this layout. These bright colors, of which I took from the Inspiration Board, are my most favorite to use. 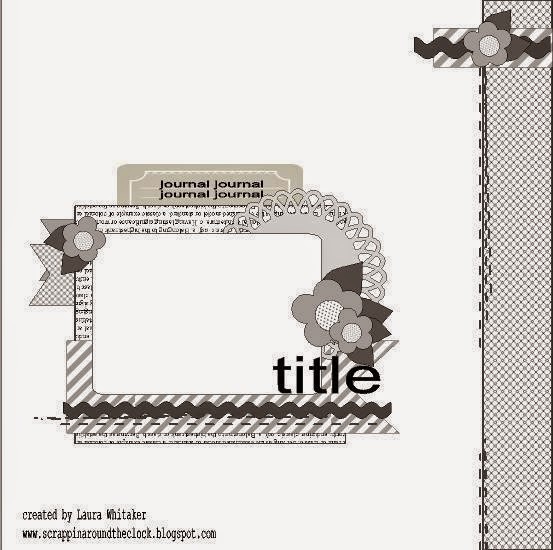 For more detailed shots of this layout, please visit my blog at robinredd.typepad/reddrobinstudios." 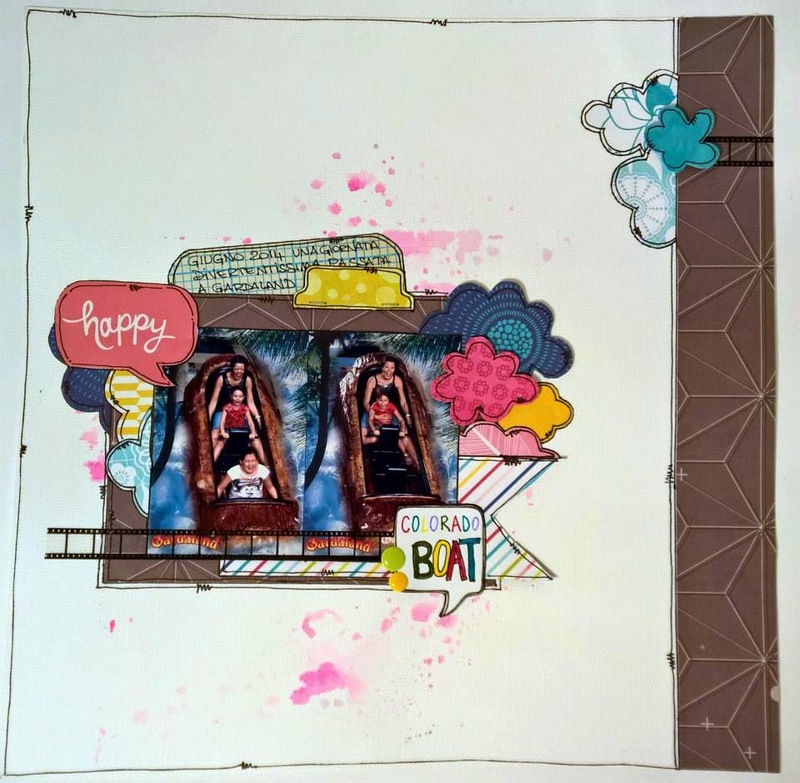 We would love to see how Laura's sketch and the photo inspiration inspires you. 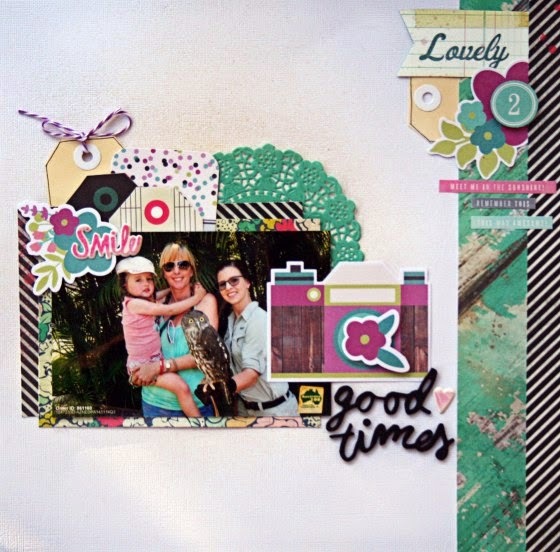 "It was a pleasure creating this layout based on Laura's pretty sketch and the fun ecclectic mood board provided this month as inspiration. The first thing that caught my eye was the image of the black and white striped cloud so I started with a similar pattern as my background. 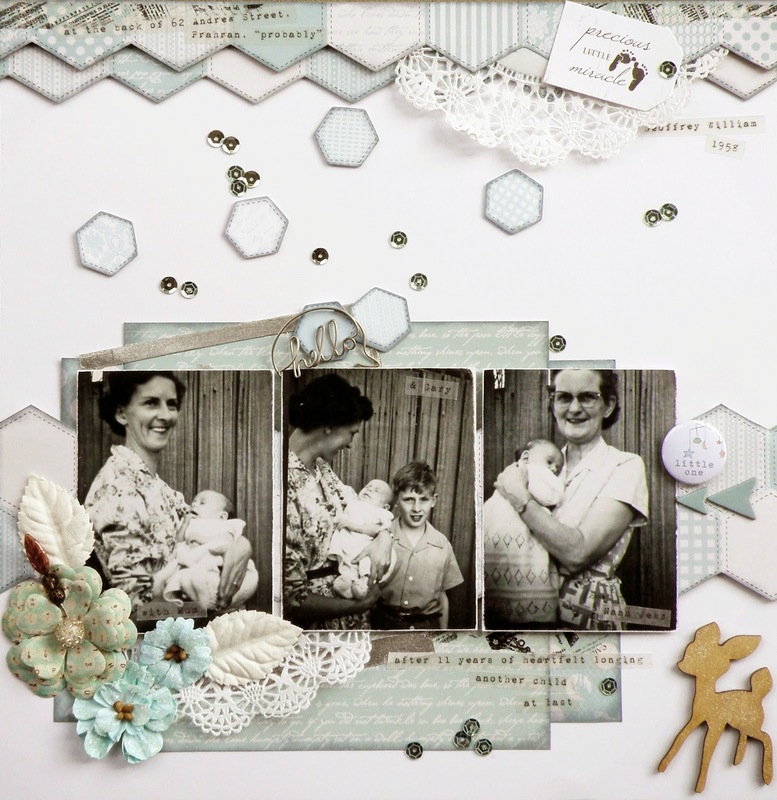 Pretty much all stash used comes from the Flea Market collection from Crate Paper which I found matched very well with the feel and the colours of the pictures. I also added a lot of gold accents and lots of sequins to match the lamp base and the confetti on the mood board. And last, but not least, the photo I used features my nieces showing off their adorable painted faces which represent the image of the painting in the top right corner. 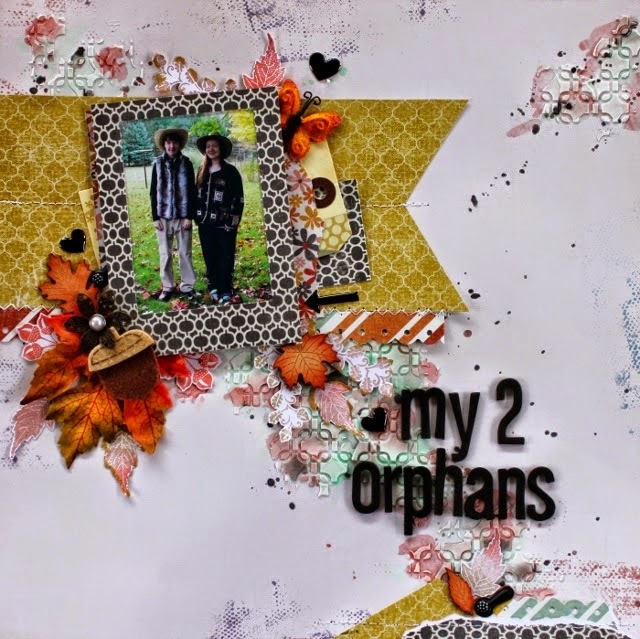 If you want to see more details, visit me at Scrap-Utopia"
Inspired by Nicole's beautiful layout? Create a layout using the sketch and any element from the photo that inspires you. What a fun challenge as usual right!? 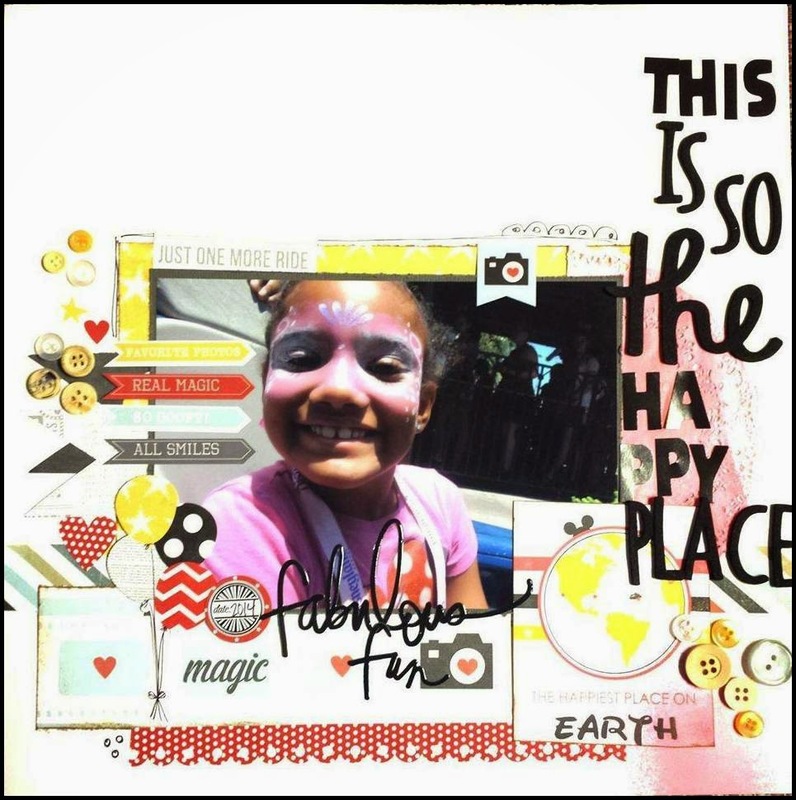 For this layout, I used Simple Stories, Say Cheese Collection, random alphas that I had in stash and some of Heidi Swapps letter stickers, along with additional embellishents. Hope you enjoy the challenge as I did!" 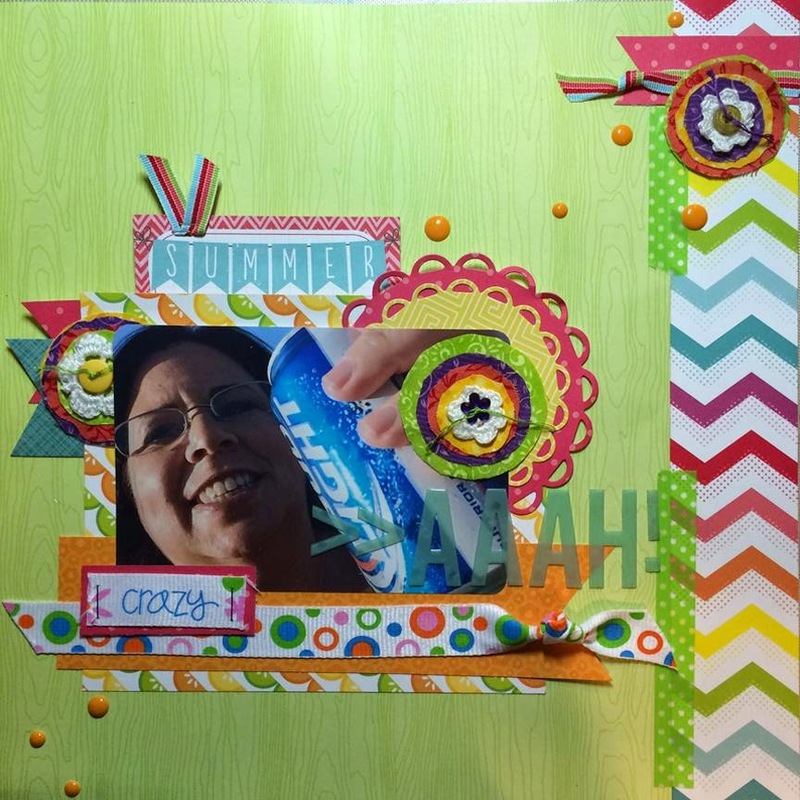 Your challenge this month is to create a layout inspired by the sketch and any element of your choice from the inspiration photo. You can use the colors. shapes, sayings, etc, just note when posting your entry, what element you used as inspiration. 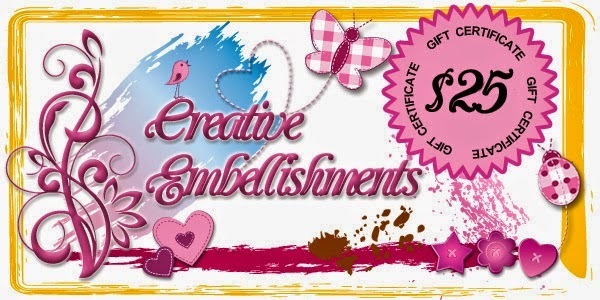 Creative Embellishments is our sponsor this month. Enjoy the rest of your day and make sure you return tomorrow for more Design Team inspiration! "Now that summer is almost here I decided to use this photo of mine from summer of 2013. Heidi Swapp papers, the colors are just perfect. I dug into my stash and found the gold doily, and added splatters of some gold and teal color shine. I hope my layout will inspire you! 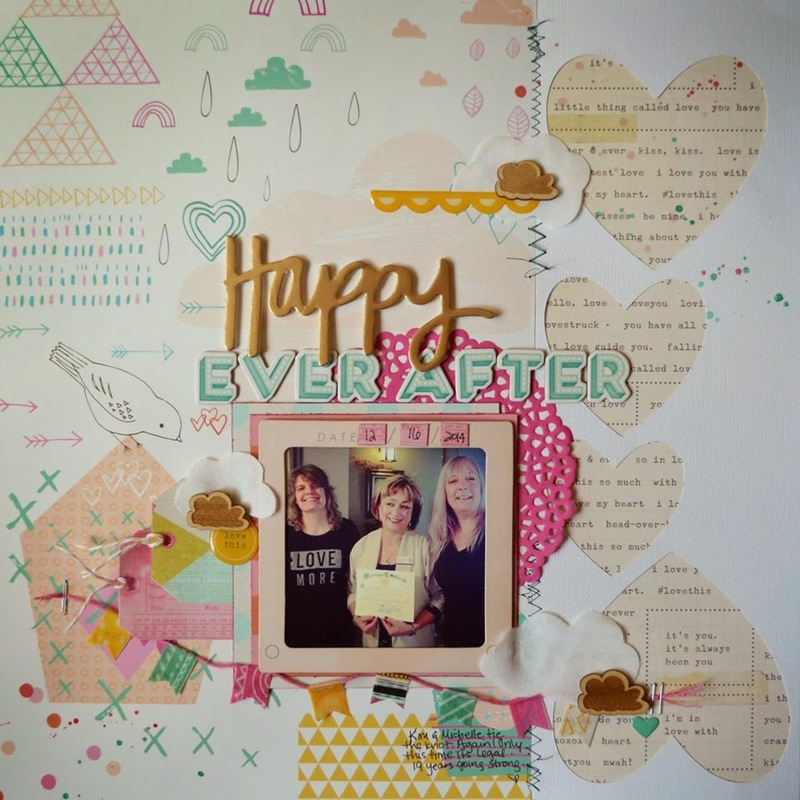 Can't wait to see what you can create using the sketch and mood board"
Enjoy the rest of your day and make you return each day for our daily design team inspiration! 'The first thing that caught my eye with the inspiration photo was the bright pink and ombre. I used watercolor paint to create an ombre effect on my background. I was also inspired by the clouds in the photo which I added in the top strip and the banner strip behind my photo. I rotated the sketch so the cloud banner would be at the top of my page. I loved the colored polka dots in the inspiration photo and found some an old 6x6 paper pad from Echo Park which matched perfectly! I pulled the black and beige striped pattern from the clouds in the photo and tucked strips under my photo. I used the quote in the photo as my title and was inspired to use gold and multi colored letters. The last bit of snow just melted in my corner of the world. 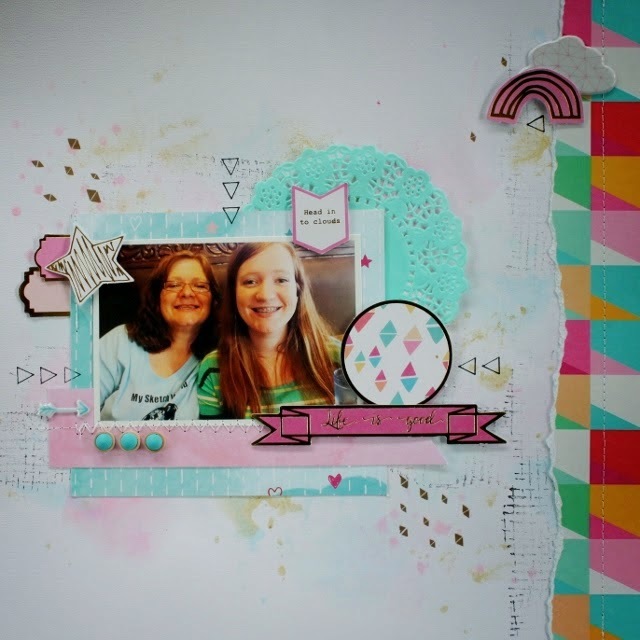 It sure was a long winter, but I couldn't help but create one last "wintery layout" using fun bright colors! 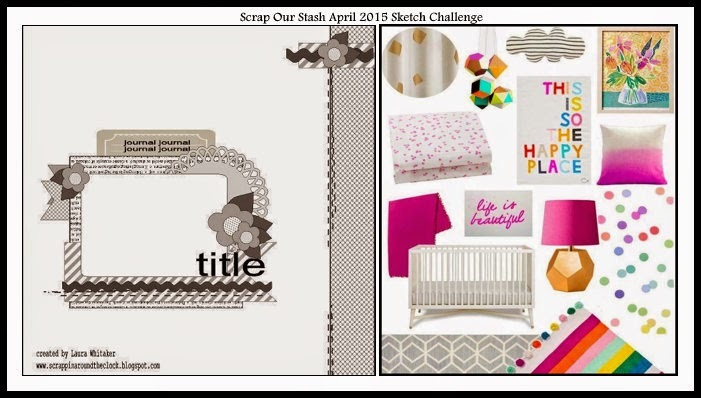 Return tomorrow for more Design Team April Sketch Challenge inspiration! "The moodboard inspired me to scrap this photos that I took during our vacation in Spain last year. There were tons of lampions hanging, along the street in the city of Ronda. I love it very much, since I LOVE all colourful things. I was also inspired by the colours of the moodboard. I used the pink ombre designed paper from Dear Lizzy for my background, relating to the pink ombre pillow. The colourful dots inspired me to use sequins and to make those mini lampions out of origami papers. 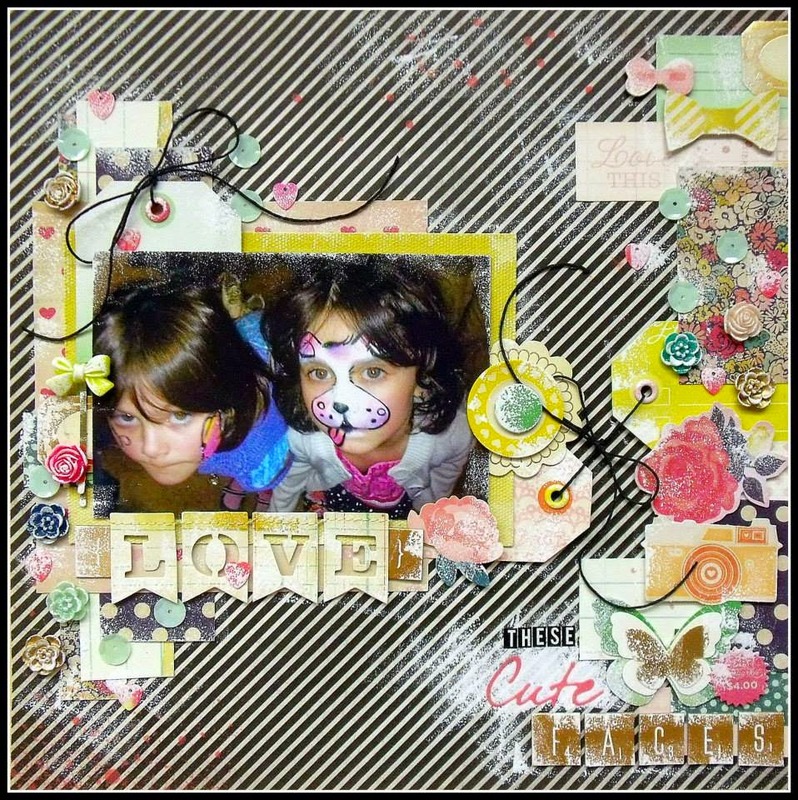 I found that the striped cloud in the moodboard so cute that I also had to add it on to my page. I had to turn the sketch one time to the right so it could fit better to my Photos. This fabulous sketch from Laura Whitaker is so perfect for my pictures. Now it's your turn. Can't wait to see what you create." 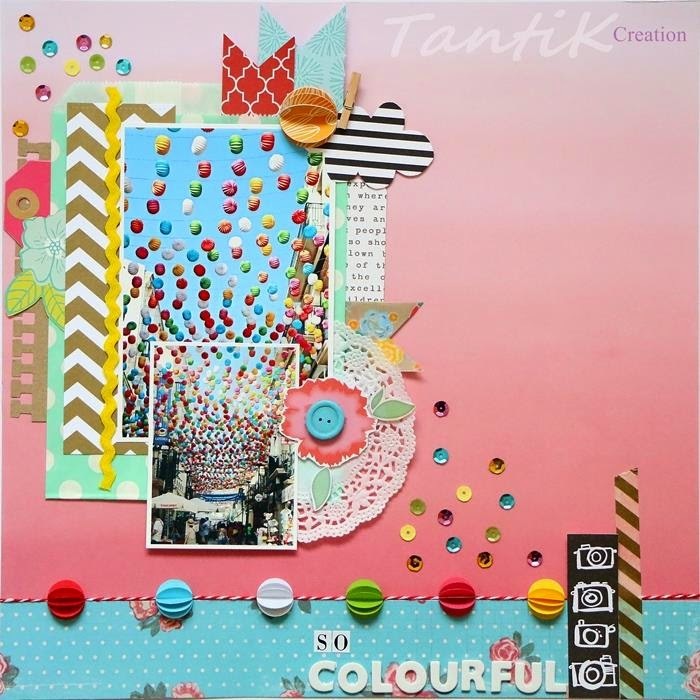 Inspired by Tanti's beautiful layout? Thank you for stopping by and make sure you return tomorrow for more Design Team inspiration! We are starting the weekend off with some awesome inspiration from DT Elena! 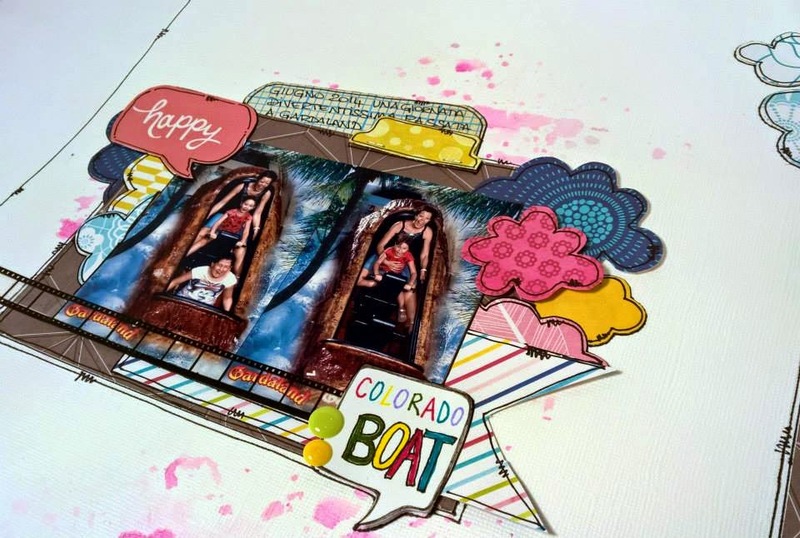 "These photos taken on the Colorado Boat in Gardaland (an Italian amusement park) speaksfor themselves!! (my mom, and family friend with her daughter :D). 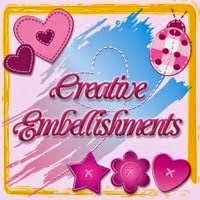 As inspiration I used the cloud shape, color fuchsia and the multi-color phrase. Let us see how this sketch and inspiration photo inspires you"
Your challenge is to create a layout inspired by the sketch and the inspiration photo. All you have to do to enter into the drawing, is complete one or both of our April challenges and link up by April 29th. You will receive an entry for each challenge completed. Thank you for visiting us today and I hope you return tomorrow for more Design Team inspiration. "We Love School" LO by Brenda R.